Cash transactions are undocumented. I don’t want anyone else to know how much I earn, where I spend it, and what I save. Period! I choose cash. So does the majority of Pakistan’s population. Despite carrying a credit card and two debit cards in my wallet, I still prefer to use cash for all my transactions. I have my reasons for doing so; however, I also feel my ideology regarding plastic money is a depiction of the general consumer mindset. 1. I feel more secure with cash in hand. It gives me greater control over my spending and allows me to exercise frugality where needed. With a debit card, I have the ability to ‘swipe’ away my entire income or savings at a retail outlet. Credit cards are worse – they enable me to spend what I don’t have. Using cash for all my purchases therefore restricts my ability to splurge beyond my means. 2. Retailers and restaurants rarely accept cards. And if they do, they charge a premium of 2.5%. Why should I take the hassle of relying on my cards if they won’t be accepted at my choice of restaurant or grocery store? Furthermore, why should I pay extra when I perpetually feel that I am a victim of unprecedented inflation in this country? 3. Cash transactions are undocumented. I don’t want anyone else to know how much I earn, where I spend it, and what I save. Period! For our banking sector, these three reasons prove to be the greatest deterrent to the progress of plastic money. Changing consumer behaviour can only be achieved if their mindset is altered from its existing course; for this purpose they need to show the real value behind using debit or credit cards. What banks need at this stage, is a satisfactory response to the apprehensions and concerns stated above. 1. Debit or credit cards are actually more secure than cash in hand. There is no monetary value of the card in my wallet as compared to actual currency notes. In case of loss or theft, a card can be blocked instantly to prevent withdrawal or usage by unauthorised individuals. Cash is irreplaceable! Furthermore, banks allow me to report and claim compensation for disputed or fraudulent transactions. This augments the security features offered on my cards as compared to the cash loss I suffer during misplacement or theft. In the case of my credit card, by keeping my credit limit equivalent to my income, I effectively curtail the urge to splurge beyond my means. 2. The argument that retailers or restaurants rarely accept credit cards can be negated. As per the latest State Bank report for the quarter-ending December 2014, Pakistan is home to 34,945 Point of Sale (POS) terminals. This number has increased by 1.4% since its previous quarter. Albeit a nominal increase, it shows that my cards are presently acceptable at nearly 35,000 outlets across the country. Furthermore, the 2.5% surcharge by merchants is not a regulatory requirement. I am not liable to pay that amount. If a retailer is charging that additional amount, I can contest it or even report his malpractice to his POS-issuing bank. Now does using a card cost me more than cash? Not at all! 3. I want my transactions to be documented. I have nothing to hide. I earn through legal sources, I pay all my taxes and spend legitimately. Furthermore, using cards helps me keep a greater tab on my expenses – my statements show exact locations, time and amounts for each transaction. It helps me manage my personal budget better. On a macro-level, I am assisting my economy by switching from cash to plastic money; in essence, I am helping in increasing the country’s financial inclusion rate. My expenditure patterns and trends can further be studied by marketing analysts and product development teams to provide more customer-centric solutions to consumers like myself in the future. 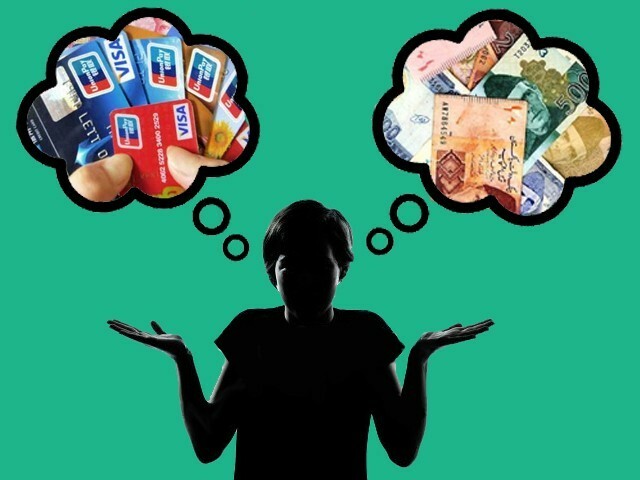 While the banking sector uses its primary marketing mechanism of deals and discounts to coax me into using plastic money more effectively, I feel that my behaviour would only change once I accept that my cards are better for my financial well-being as compared to cash. He is the CEO and Co-Founder of mybankersonline.com – Pakistan’s pioneer website on consumer banking and personal finance. He holds an Honors Degree in Economics and Mathematics from Lahore University of Management Sciences. Privatise this, privatise that – just make me rich! Cards are going to be the death of me. In the last one month I’ve spent an obscene amount of money on shopping, an insane amount- my husband hasn’t figured it out yet. When he does, oh man, I am going to be soooo dead. so dead, dead, dead, DEAD. And I still gotta buy those sunglasses, I am amazed at my own guts. But I have got to do , what I have got to do..
Saad Saahib some point needs to be amended I think. Firstly 1. Debit or credit cards are actually more secure than cash in hand… Well the additional security you are referring like blocking instantly is not so instant in most cases. have worked at a bank(s) and seen things you can take it it take some time more than 20 mins to contact the call centers to block them. Resulting in fraudulent transactions not once but in cases more than 5 times and POS transactions are as easy as come n go so debit card payments are deducted instantly from victims bank account. Making a hassle to identify the culprit, recovering merchandise and reverting transactions.